Is your desk broken? If so, maybe that causes your work to be less productive so far. According to research, 4 out of 10 workers say having neat and organized rooms helps them be more productive. Then, about one in three people say productivity can improve their careers. Nevertheless, tidying up the piles of paper on the table is not an easy matter. Moreover, making it able to survive remains tidy constantly. Well, to help you, follow the advice of the following room organization expert. It is recommended that you completely empty the entire table or workspace first. Then start putting important items such as computers to place the files in the most important order. On the left side, you can put the files that need to be done, and put them to the right side after it’s finished. If it has been cleared, do not forget to remove the trash from the rest of the file. Organizational expert Felice Cohen said it was difficult to measure how long someone had to keep work documents, because everyone had a different job. Therefore, if the files have been moved to digital data, then physical files can be immediately discarded. You have to start moving physical files to digital by scanning documents or photos. After that, clean the desktop by arranging the file. Collect files according to priorities such as paying bills, next quarter budget drafts, marketing materials and so on. Start getting rid of messy paper, including post-it notes and replace with accessories to take notes that are more stylish. In addition, prepare a small cupboard that can store several small items such as pens, staples, and other items. 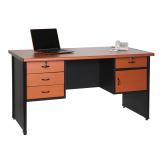 The office desk model of the LMK 1475 L / 1675 L from Lunar Furniture was designed with an adequate number of drawers. So you can put all your documents and work equipment better and neater. Call immediately 021 54376 555/333 or click www.lunarfurniture.com for more information.